I wanted to make a black jersey dress for summer and started rifling through my wardrobe to find some inspiration. I decided it would have the neckline of one of my singlet tops and the bottom section of one of my dresses and it would incorporate one of the pretty crocheted pieces I bought online. All bases covered. So far so good. 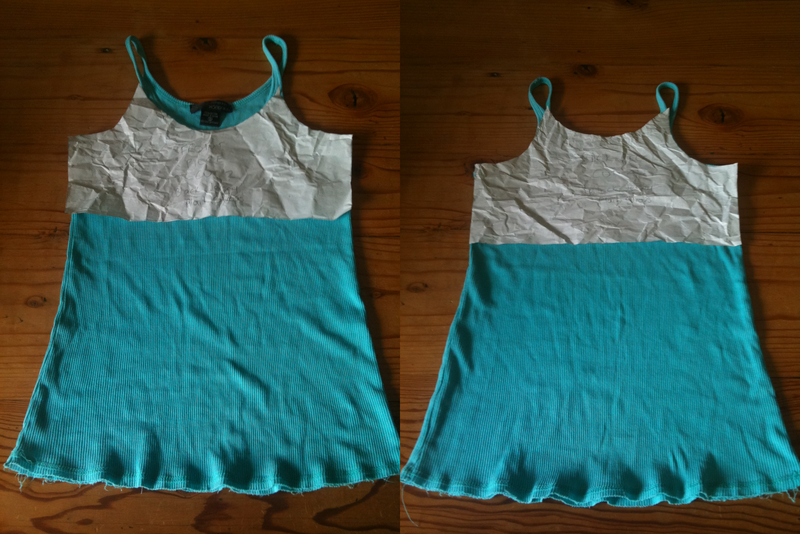 I traced out the shape of the top of the singlet top onto some paper like so. 35 cms (the width of the singlet top part) + 5cms (per pleat) by 8 (the amount of pleats) which equalled out to be 75 cms + 2 cms of seam allowance. I measured the length of the bottom section of the dress as 55cms and added my 2cms seam allowance. In the end it meant cutting a 77 x 57cm piece of fabric. The back of the dress needed to be 35 cms wide at the top and 75cms wide at the bottom with a length of 57cms. To get this even I measured out 75cms on the bottom edge of the fabric, measured 57cms for the length and measured out 75cms at the top. From those marks at the top of the piece I could now measure 20cms in and have an even piece. Are you sick of all the maths yet? Now I could trace on the pattern pieces for the top section of the dress onto the fabric. Once I cut out all the pieces I sewed the top pieces together with right sides facing. I turned them right way out, pressed them and sewed the front top piece to the back top piece. Now it was time for the bottom section. I started by marking out the pleats and pinning them carefully before lining up the front bottom piece with the back bottom piece right sides facing, so that I could sew them together. Then I turned the top piece inside out and slipped it over the bottom piece with right sides facing so that I could pin them together and sew. Wow the lighting was exceptionally terrible on these ones, sorry. Now the next part would be to make your straps. Because I had this pretty crocheted piece I bought off etsy here. I first handsewed it to the top back piece before making bias tape for the straps, measuring the length needed and sewing the straps to the front and the crocheted piece. The only thing left to do is wear it!